Friday morning, 4 am: 1 BFC (big effen can) of a highly caffeinated beverage was all I needed to start my trip to Tennessee as I drove with my parents to Fayetteville for the first big endurance race on the calendar. However after a solid 4 hours of driving the caffeine buzz wore off and left me to rest and sleep in the back seat until about 5 hours later when I took my second and final driving shift of the day. All in all the travel consisted of somewhere between 13 and 14 hours of driving. Not bad for a day trip. Even though our arrival had left me time to pre-ride the course, I was slightly reluctant due to the thunderstorms that were in the surrounding area. But with a little bit of convincing from dad, I figured it would be best to go churn out a quick lap and check things out. This little suggestion was the first of things which had saved the race from being a complete disaster, because after completing the majority of the lap catastrophe struck as my Lefty suffered some internal damage and deemed itself useless for the weekend. Luckily my dad brought his Rush along, so the problem was able to be fixed as a working Lefty was swapped out for a broken one thanks to the help from the guys at Cahaba Cycles. Race day brought a course filled with thick and schloppy clay. For those who are unfamiliar, this stuff sticks to anything and will bring you to a halt as it packs up on your wheels. 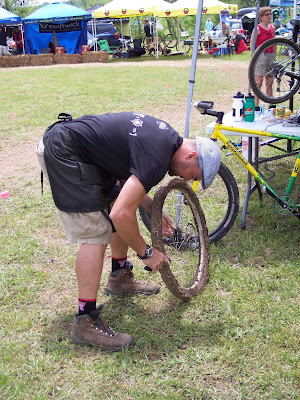 Besides the mud, I would be faced with some of the best and most respected endurance racers in the country including Tinker, Mark Hendershot, Nat Ross, Ernesto Marenchin, Josh Tostado, and Yuri Hauswald just to name a few. Luckily I had some great support during the race with my dad and Hodge taking care of the bikes and mom taking care of the nutrition (cinnamon rolls, oatmeal cream pies, pb&j, pancakes, and other delightful snacks). So all I had to do was focus on pedaling into delirium. 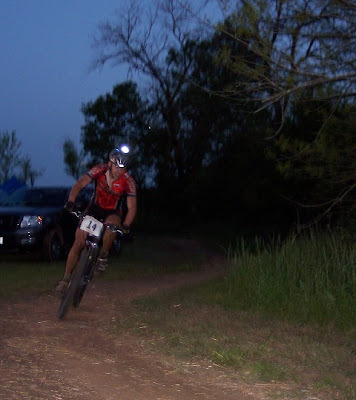 From the gun, I was in good position somewhere in the top 5 as all of the racers funneled into the singletrack. Things were going smooth until the first big climb when the clay started to pack up really good. So the process would begin: Ride. Stop. Remove mud. Ride. Stop. 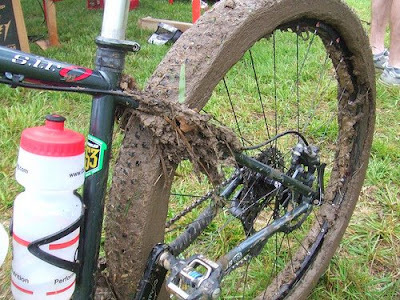 Remove mud…. This went on for the entire first lap and even with all of the stopping, I was still in 2nd place behind Tinker and the chase began. By lap 2 I smartened up a bit and found that I would have to stop less frequently if I were to hike up most of the climbs with the bike on my back (even pushing the bike through the mud would leave massive clay deposits on the wheels). This strategy allowed me to keep Tinkers gap from increasing and throughout much of the day I would slowly real him in. 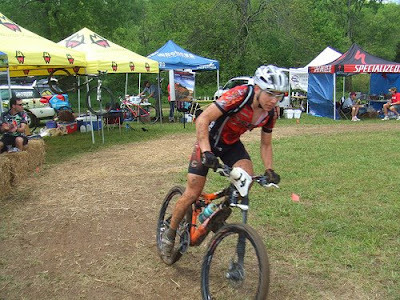 By lap 4 most of the course had dried out and the trails were becoming fun to ride and even fast in some sections. The irony in this was that the first 3 laps sucked that much energy out of me that the middle ring was still the gear of choice. Had there been no mud to begin with, the big ring would be the only ring for this course. The afternoon was hot and humid. Kind of like Iron Hill was last year if you had the chance to race there. With the heat came multiple cramps and salt stains that left me looking like a giant powdered donut. Still pushing on, I had to stay focused on the chase. Towards the end of the race only 9 minutes had separated me from Tinker and about 12 minutes separated me from Josh, who was in 3rd at the time. Pushing through to the end, I was unable to close the gap but finished only 6 minutes back. Though I didn’t take the win, this 2nd place finish was definitely one of my best to date. I would like to thank everyone that helped out all weekend; my parents for their continued support, extra thanks to Hodge for wrenching all day (he was also pitting for Tinker and Mark), Cahaba Cycles for helping out the night before the race, and to everyone else who helped to make Dirt Sweat and Gears such an awesome event. They really know what mountain biking is all about and didn’t disappoint in the least bit. I can’t wait to come back again next year, and I would recommend this event to anyone who reads this. sweet race. 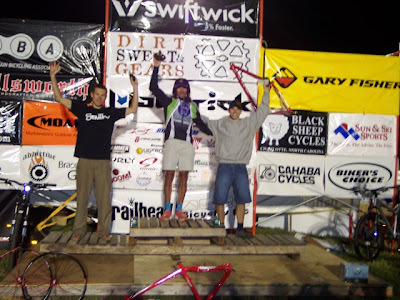 What frame is that your holding in the podium shot? Wow, hell of an effort. Congrats.